When Donald Trump’s puppet Attorney General William Barr spent this weekend deciding how to publicly characterize Robert Mueller’s still-secret report, Mueller was not consulted at any point. That tells us all we need to know about how little interest Barr has in allowing the public to know the truth about Mueller’s probe. But according to several major media reports, someone else was in the room this weekend while Barr was deciding precisely how he wanted to lie to the American people about the Mueller report: Rod Rosenstein. So now we have a problem, or at least Rosenstein does. William Barr’s “summary” of the Mueller report is in such deep conflict with what Mueller has said in his court filings, and what’s played out in plain sight, it’s obviously a fraud. This isn’t shocking, considering that Trump nominated Barr to this position specifically to protect him from Mueller, and that Barr’s own prior words made clear that he was willing to obstruct justice on Trump’s behalf. But why would outgoing Deputy Attorney General Rod Rosenstein have decided to stick around at the DOJ a bit longer, just go along with this Barr stunt? There are only two possibilities. The first is that because Rosenstein is on his way out the door and has no remaining leverage of any kind, he was unable to convince Barr to do the right thing. The second is that Rosenstein is just as corrupt as Barr is. We have no way of knowing which of these is the case. We do know that Rosenstein will be subpoenaed to testify about this by House Committee after House Committee, and he’ll have to spell out for us what really happened here. We all saw Rod Rosenstein, just days after being appointed, write a fraudulent memo justifying Donald Trump’s illegal firing of James Comey. We then saw Trump try to publicly lay the entire thing at Rosenstein’s feet. After that, Rosenstein seemed to spend the entire Mueller investigation trying to protect Mueller from Trump. 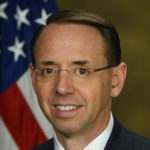 So is Rosenstein the corrupt guy we initially thought he was, or the good guy we subsequently thought he was? Only he can tell us – and those inevitable subpoenas will ensure that he has to tell us.